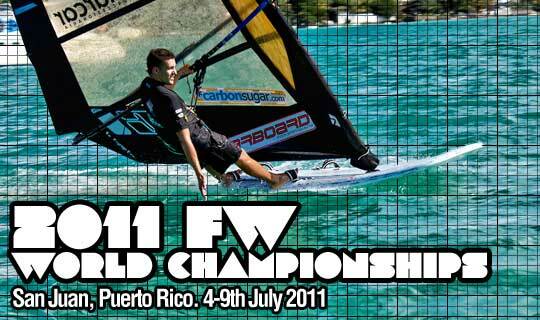 Hi everyone, we’ve just arrived a few days ago in San Juan, Puerto Rico, getting ready for the 2011 Formula Windsurfing World Championships which start on Tuesday. Here you’ll find some daily reports during the event from myself with a bit of insight behind the scenes at the event as well as all the nice photos I can collect from the event webpages (unfortunately I can’t shoot my own as all my camera gear was stolen last week on Aruba). If you want to get involved with the Twitter stream on the right sidebar, just include the hashtag #PR2011FW whenever you write a tweet about the event and it will automatically appear on the feed. Stay tuned for more updates starting tomorrow when the registration begins……. So the registration kicked off today on the 4th July Independence Day holiday. The beach was jammed with thousands upon thousands of Puerto Ricans taking advantage of the hot sun and cheap beers over here and taking up all the space on the beach. We have a super big tent on just across the road from the beach for all the gear which means we can rig on GRASS instead of concrete (which is awesome) and Jose, who’s been driving everyone back and forth from the airport all week continued his work driving all our equipment from our hotels/apartment’s storage to the event site in the blistering heat. Everyone who is anyone is here. Former and current World Champions like Antoine Albeau, Steve Allen, Wojtek Brzozowski amongst the regular top guys like Arnon Dagan, Casper Bouman, Paulo Dos Reis (and 300 more Brasilians), Gonzalo Costa-Hoevel, Jesper Vesterstrøm, Micah Buzianis, Martin Ervin, a bunch of Polish, French, Americans, Argentinians, Latvians and one lone guy from Australia on a black Point-7 sail. I haven’t seen the final count but I assume its around 50-60 guys and a World Class fleet. If you look up Windguru the forecast is for 8-10 knots most of the week (including today) but the reality is you need to add about 10-15 knots on top of that because today (and most days this past week) it’s been +20 knots and plenty of guys were out on the 10.0m today screaming……….! I brought with me one board, one sail, one mast, one boom and despite registering a bunch I know I’m only going to use one fin. I think its about time we cut the gear we need to these events as I helped carry bags today for some guys and a lot of them brought 6-8 massive 3m bags at 40kg and Antoine had 12 bags in total (including his slalom gear from PWA Aruba). WTF?!! It’s a joke. Please vote for my 2 sail submission at the AGM on Thursday!!! That’s about all to report. Tomorrow we’ll kick off the racing and a party sponsored by Corona beers will be kicking off straight after we get back on the beach. Stay tuned……….. When we left the beach last night after putting the equipment in the gear tent that was about all there was on the beach in terms of infrastructure for the event. 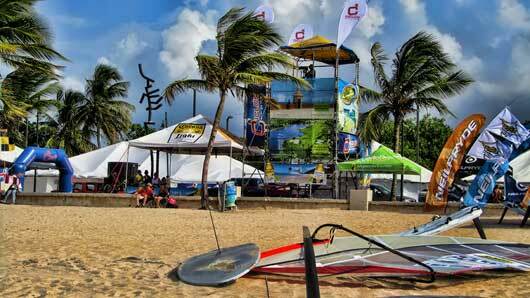 When we arrived this morning we were surprised to see another 15 tents on the beach; some big tents to allow us to store rigs between races, food tents, drink tents, DJ booth, photography tower and of course, the Corona tent full of the beautiful Corona beer promo girls. Ahhhh. 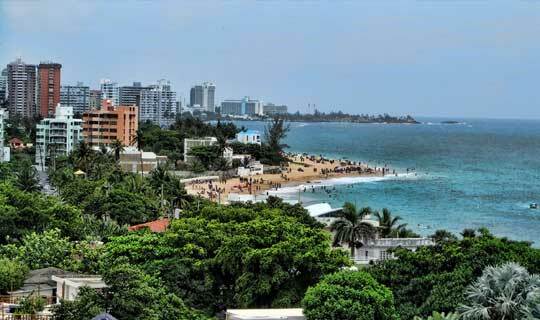 Nice work Puerto Rico!! Race 1 kicked off on the scheduled start of 2pm and despite Bruno calling it 16 knots on his Facebook tonight the wind was around 22-25 knots with a viscous chop/swell running through the course over the various reefs. The startline was insanely port biased and it was clear the port start was the favoured route so after about 4 massive crashes which ended with 2 split boards and Casper Bouman taken away in an ambulance we were in to Race 1…. Gonzalo had a killer start leading around the first mark although was later deemed OCS which left the race win to Antoine Albeau closely followed by the Dragon (Arnon Dagan) and Vesper (Jesper Vesterstrom). 15 minutes was all we got between races which was ok because there was sports drink on ice, gourmet turkey/salad wraps and fresh fruit waiting for us in the tents in between races. The wind picked up quite a bit for Race 2 up and around the 27 knot mark (as measured at the top mark apparently) which made it a bit of a nightmare in the chop on 11.0 for me!! I decided to start again on starboard as there is some sickening crashes happening each start and I just value my life and limbs too much to push those extra couple of places you get from starting on port. This time the Dragon showed us his pre-event speed and blitzed the first mark before being passed by Antoine who later crashed on Lap 3 because apparently he was trying to hang on to a 12m in 27 knots (WTF?!). The Dragon took the bullet with BRA-boy Paulo Dos Reis clutching second ahead of Antoine and Vesper. I had a good race here sitting on the back of the front pack but ended up going too far on the last downwind and had to sail around the reef to get to the bottom mark and lost a few places to end in 13th. Race 3 the wind dropped off a TINY bit but was still up to 25 knots in the gusts. Incredibly, quite a few guys like Wojtek Brzozowski opted to change up to 11.7m sails (no idea how they hang on to them) which seemed to improve their results. I haven’t seen the results for Race 3 yet to comment on the finishers but at the start there was plenty of carnage with Wojtek (on port) plowing in to Steve Bodner and putting a big hole in his board, Arnon crashing trying to avoid someone, Steve having to hit the brakes and nearly drop the sail, losing places trying to avoid me on starboard! And then one of the french guys getting his JP split in half literally by Victor Melo was on port. Somebody is going to DIE here this week however the racing is pretty exciting as a result! We’re about to head down to the Opening Ceremony now and enjoy the free Corona beers! More updates tomorrow. Then I rounded up to go upwind and a Filip Korczycki (POL-555) who didn’t have a good start was dogging and as he crossed in front of me I went over a wave and went upwind and he seemed to falter… I could see a collision was about to happen and I bore away a bit to try to avoid it. I went over this wave as I bore away and thinking I would clip his boom in my FACE I ducked under my front arm and the boom to shield my face from his boom and as this happened the backend of his boom sliced my forearm clean to the bone. I think Filip had maybe modified the backend on his Gulftech boom? Which had razor sharp carbon edges protruding from the tailpiece where it had been modified. When you’re going upwind your front arm has a lot of tension as your squeezing the boom so the muscle just opened as it sliced. The impact wasn’t actually very hard at all because neither of us crashed. I basically just brushed the backend corner of the boom which made the cut. 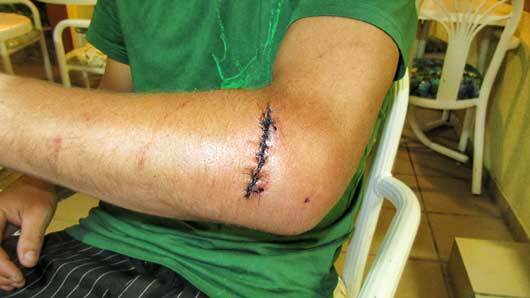 As soon as I saw my arm sliced open to the bone I knew I had a big problem. With one arm I sailed to the beach instantly (trying to keep my cut arm out of the water). Luckily some guys on the beach saw the trouble and helped me with my gear as I couldn’t lift anything… I went back to the gear tent where the medical team were. As I crossed the street to walk to the tent everyone who passed me on the street had to look away! I couldn’t see the extent of the cut because it was on the outer side of my arm but that’s when I knew it must have been pretty bad!!! The medical team at the tent came quickly with clear water to wash the wound and put big bandages around with people to hold it to keep the wound together; off to the hospital then! Cecile (the wife of the organiser, Jose) decided the ambulance would take too long so she drove me to a nearby Medical Clinic – still in my boardshorts! It took an hour to get help waiting in the emergency room, I don’t think they realised how bad the cut was, which was a bit annoying. Luckily for me there was a very experienced doctor (maybe they are used to cuts like this here!) at the surgery to stitch me up. 4 races were scheduled today and by the 11.30am start time it was obvious it was going to be another windy day. More port starters, more crashes, a shortened course compared to yesterday with a starboard rounding top mark. Today was the day for Steve Allen’s comeback. Nailing a 2nd in Race 2 with a good start but still not nearly enough speed to pass la Beau who seems to be unstoppable at this event with 3 out of 4 race wins after Race 1 today. The course was taking the leaders around 16 minutes but changed the tactics a little from yesterday with the different top mark rounding. Race 2 started in much the same way with most of the guys on 10.0’s (with Albeau still on 12m) however half way through the first lap a big dark rain cloud that had been looming over the course finally unleashed and pelted us all with stinging rain, killing the visibility on the course. The wind dropped down to around 12-14 knots which for the guys on 10.0 would have been quite a punishment! I had a fairly rough start in this race but was able to catch up a lot of places over the last 2 laps with the 11.0m and managed to claw my way back to 19th after rounding the mark VERY deep on the first lap! After a lunch break we were back out on the course. The rain had subsided and the sun was back out with wind kicking back in. By this point everyone had figured out the reefs and the best way around the course so the racing was starting to get pretty tough. I had a good start in the 3rd race today but clipped someone in some traffic at the bottom mark and put it in the drink, losing about 10 places…argghhh. Race 3 was going to be a battle between the two fastest guys on the water here; Arnon Dagan and Antoine Albeau. Both starting on port and with Dagan quicker out of the tack and leading to the mark……. then Dagan put it in the DRINK as he tacked around the mark!! I didn’t see it as I was coming in on port to the mark but he somehow managed to fall backwards with the sail and took out Antoine (and a few other guys) in the process!! Both managed to claw their way back to not so shabby results but this opened the door for the big Brasilian Paulo Dos Reis to take his first race win. Race 4 today was a little bit of a re-run of 3 but without Arnon crashing and he managed to BLITZ Antoine in the final race today and took a bullet! I had an ok race this one battling with Wilhelm Schurmann who crashed on the start and was deep in the pack a little and we both arrived on the final beam-reach to the finish at the same time however I was able to run over him with my 11.0 by about 3m as the Schurminator was still on 10.0m. Another day gone… I’ve dropped a few places but there’s still a long way to go in this event. Tomorrow we have rain forecast so let’s see what that will bring…. Not too much to report from today… Rain was forecast for the entire day and that’s what we got. Bruno delayed the first start until 1.30pm after arriving to a glassy beach so most of us retired to the apartments to catch ‘How I Met Your Mother’ which was on at 11.30am (such a good show). Arriving back at 1.30pm there was a little wind building but some dark storm clouds on the horizon. Bruno pushed the first start to 2.15pm and many guys rigged 12.0’s but in front of the clouds came a pretty big squall and the rest of us still on the beach deciding what to rig watched the first few guys sail out to the course completely lit-up in their chicken-straps heading downwind to the start. As soon as the squall finished, the rain hit and the wind dropped. We were held out on the course for another 20 minutes while the wind played with us before Bruno finally tried a start which ended being abandoned when the wind cut out to 5 knots on the startline. Another hour on the beach waiting and we were sent home with an early mark around 3.30pm to enjoy the rest of the rainy day. 1) Change the fins from 3 to 2 at events = YES. This was a fairly unanimous decision that we want to change the ‘perception’ of formula that its expensive and gear-heavy to get in to. We already know the Pro’s are going to buy 2-4 fins of each brand and test the lot, but what about the amateurs who make up probably 80% of the class? On the flip side we DON’T want fin manufacturers to sell LESS fins! We want to support the people who support us, so I think by voting this in, people will feel more competitive only owning 2 fins and most people may still buy 3 fins and register the perfect 2 for the event. 2) Change the sails from 3 to 2 at events = YES. This was always going to be an interesting one. On paper it was actually my proposal but it came about from discussions with many Pro’s and at local events I have been to around the world in the past 6 months. 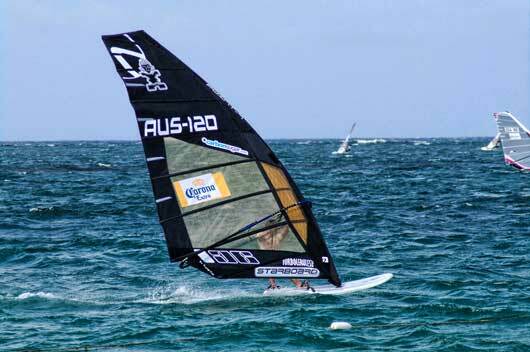 It was also something the AWA (Australian Windsurfing Association) agreed with however later we had a re-vote of more ‘FW orientated’ sailors within Australia (not all of the AWA committee are active FW sailors) and Australia voted NO to it. Lot’s of interesting discussion came about from this proposal. Sailors in Poland and Brasil were heavily for it as this apparently had been a deterrent for many sailors who’ve left the class in recent times; also with many parts of the world still effected by the Global Financial Crisis, reducing the cost of equipment to be competitive in this class is a big step forward. 3) Make all sails a solid colour (ala Point-7, North etc) = NO. This was decided it would be too difficult/expensive to implement. 4) Build a new Marketing Strategy for the FW Class = YES. 5) Allow an ‘Open Development Class’ to operate alongside the FW class at events = NO. I think this proposal was completely misunderstood by everyone at the meeting. The suggestion wasn’t to allow full custom equipment by every sailor at a World Championships, it was that in National events, there are some local board builders and DIY sailors who’ve built/customised their own boards and want to use them. Normally they are banned from events with these illegal boards but the proposal was that we have a separate division and start for them to allow them to compete. In a sense, we’ve been doing this in Australia for 3 years already; targeted at getting new people in to the class and letting them use any board they want, generally speaking this has fostered new sailors to get in to the sport and purchase the ‘right’ equipment down the track. It hasn’t effected any of the racing for the top guys even though we let them all start on the same line in the same sequence. A VERY interesting meeting last night and lot’s of decisions that will definitely change the class around a bit next year. I think all the decisions were for the better of the class but it will need some careful thoughts during development of next year’s equipment to make sure it benefits both the light/heavier sailors and the amateurs all the way to the Professionals. I don’t really want to blame Arnon for taking the last of the milk this morning so I had to eat toast instead of the awesome Honey Oat Crunch cereal we bought, but something REALLY cursed me today; I safely managed to get all my 3 discards in one day. Blarrrghhhhh!!! 11.30am start, lighter winds around 12-16 knots, bright sun – should have been my day. Race 8 started with me getting clipped on starboard coming off the line and somehow managing to stay upright but completely killing my start forcing me to tack off on to port and get drilled by the rest of the port fleet sailing over the top of me half way up the first leg. It was low-tide for the first part of the day and everywhere I went I seemed to get stuck on the wrong tack having to avoid a reef. Up the front it was young Gabriel Brown who decided today was going to be his day (I bet there was milk left at his place this morning) who spritzed (as Arnon would say) Antoine to take the first race bullet. I somehow managed to break some battens in the shorebreak coming in from this race and with only 15 minutes in between races I didn’t have enough time to fix them and subsequently missed the next start by a few minutes. Decided I might sail the race anyhow for a laugh and waving to the boys on the boat as I cruised the startline about 4 minutes after the rest of the fleet (#FML). The wind went super light and shifty in this race, allowing Micah Buzianis a chance to get ahead on the second lap and cruise home to victory ahead of Arnon and Gabriel. After a short lunch break and some more batten construction we were back on the water for Race 10. The wind did look like it was starting to fill in and in the gusts was around 18 knots, but most of the front fleet were still on 12’s (Antoine on 12.5m). I took a boat start on starboard with Micah which lined up perfectly with the shallowest of the reefs about half way to the layline. I assumed Micah would tack off and save his fins but he didn’t and neither did I. Fortune favours the brave and somehow both of us managed to sail through the breaking waves on the outer reefs without touching our fins. I’m going slow as a dog on port so lost a few places running to the mark trying not to get flipped on the big swells outside the reef and rounded the mark about 6th having to let Arnon cross me on starboard (kind of felt like just clipping his boom on the way past for taking the last of the milk this morning, but the guy paid for my chicken quesadillas last night so I let it slide, hahaha). I lost a few places on the downwind as I had the track all the way back in the slot on the HWR and quite a stiff mast in my sail for the lighter winds, so the sail was just bouncing me around like a ragdoll as I went over the swell downwind and I watched as Vesterstrom and Arnon came charging past me in to the bottom mark. I rounded just behind Dennis Littel at the bottom mark and sat in his dirty air upwind (he was pointing like a machine on the PD board) getting punished but managed to hang in there but I think I tacked a little early on to starboard and lost 1-2 more places as the guys who went a bit further along the beach got a better lift to the top mark. Clung on to a 12th this race. There must be someone looking down on the Browne family this week as just flicking over to the PWA site it seems that Marcilio finished 4th in the Pozo wave event right about the same time the smaller Browne (Gabriel) came from NOWHERE today to jump to 2nd position overall for the event. The final race today I didn’t sail as I got KO’d on the startline so just thought I’d save myself the trouble of getting a 40th and sailed back to the beach. Arriving there about 3 minutes after me was a very shaken up looking Dennis Littel. Dennis had just been CRUNCHED from behind by Arnon travelling at full speed hitting Dennis’ knee with his board as he tried to avoid killing the guy. So after Casper on Tuesday we now had to take the next Dutch guy to the hospital (thanks again to Cecile for being the designated ambulance!). [update – Dennis is all good, X-Rays showed nothing is broken, just bruising and swelling. Nothing a few vicodins can’t fix, although I doubt he’ll race tomorrow]. So that was the end of Day 4 and my worst day of racing that I can remember. Just to really put the icing on the cake I managed to rip my harness catching it on something sharp as I carried gear back from the beach. But luckily Arnon still owes me another dinner so I can at least enjoy quesadillas once more (found arguably the greatest mexican restaurant on planet earth here the other day) without too much stress. Final day tomorrow… I need to get my sh1t together and get back in to the Top 16 (or at least just beat Mathias Pinheiro). Arnon needs to get his sh1t together and start winning races as he’s clearly faster than Antoine and we ALL hope Dennis is back on his feet tomorrow and able to slot a few more Top 3 finishes in to wrap up his event. Today was Arnon’s day. We knew it as soon as we got up this morning; cause he was as nervous as a highschool kid meeting the President. We had 4 races scheduled today in winds around 10-12 knots for the first race but building up to 18 knots by the end of the day. I had a horrific start to the day breaking some battens in the first race then crashing in to someone on the second start and breaking my mast. Basically 2 DNF’s as far as my results go but managed to have 2 solid races to finishes off the event but still ended up way down in 22nd place due to the races I wasted breaking things; argggh.. Anyhow, I know I can get solid Top 15 results when it goes my way so that’s nice to walk away from the event with. Arnon, the conqueror. Taking 3 bullets from 4 starts today he finally showed us the dominating speed he had whilst we were testing the week before the event. Arnon dragged back 2nd overall after today (his best result in a FW World Championships) and knocking out the super consistent Gabriel Browne, who had a couple of 4th’s and a 7th today to keep on the podium in 3rd overall. Gonzalo, Steve and Jesper also had a solid day today, making up 5th, 6th and 7th overall with big man Paulo Dos Reis finishing ahead of them in 4th despite crashing in to me on port in the second last race today (the guy does not stop for anyone!) but luckily he’s a nice guy and none of us fell off so a protest was unnecessary. Tonight we have the prizegiving ceremony in Old San Juan. Not entirely sure what to expect but based on what we’ve seen here the past week none of us are worried; Puerto Rico definitely put on a great event and the conditions during the week were very conducive of great racing. Very easy to run a great event when the wind blows everyday, but even then, PR definitely put on a great show and the locals took that extra step to help out a lot of us sailors with all sorts of non-racing related requests we had! Big shout out to Jose, Arturo and Nono who gave Arnon, Steve and I a big helping hand during the past 2 weeks !! Not really sure how Jose is going to go getting people to the airport at 4am tomorrow ……yikes! For me now its flights back to Milan, stopping in New York to catch up with Jesper Vesterstrom for a few hours (he’s based there now) and get ready for the PWA Fuerteventura slalom World Cup in 10 days (not that I want to even go windsurfing again any time soon after this week!!). Good luck mate! Looking forward to reading the reports. What’s the sail Antoin is using in your twitter photo? Looks old. It’s actually a NEW prototype (not an old sail). I haven’t seen it up close but I assume it’s easier to build prototypes from the materials they have in stock on Maui rather than the expensive coloured materials in the production sails. Looks like Antoine has a proto 12.5m and 12m here – haven’t seen his 10.7m yet. 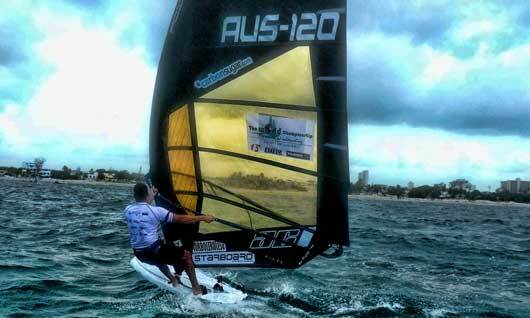 Lot’s of proto sails rocking around here though – the Gaastra ones Arnon Dagan has look nice. Good healthy news for gear development I guess. i’m looking forward to your coverage, good luck in the races! Limiting the rules to 2 rigs won’t stop anyone from buying 3 rigs. For exampe, most guys in San Francisco sail with 9 &10 m.
Try that anywhere else and you’ll never be able to compete. 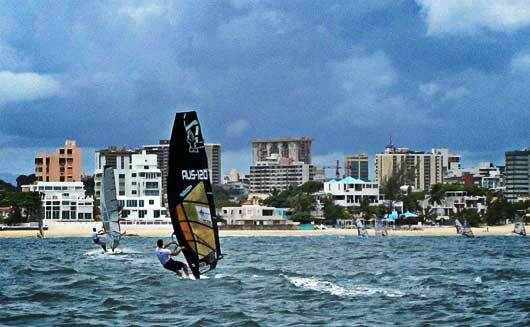 Sailors in Europe regularly sail with a 11 & 12 m.
Try that in SF and you wont even get off the beach. Actually I’m not trying to limit the amount of gear purchased at all !! Don’t want to hurt the manufacturers; I think we still want people to buy 3 rigs… more what I was thinking was to limit the gear you need to bring to specific events. Sure, there will still be events you might want to bring 4 rigs and test to find the right sizes, but there are TONS of events guys are skipping because it’s too hard to fly and they see not bringing enough gear as an admission of defeat. I already know 4 guys who didn’t come to this event because they couldn’t get 10, 11, 12 with masts in one bag under 32kg. I only brought 1 sail for the same reason… Most likely going to get punished here as a result … such is life I guess. I don’t know if 2 sails is the answer… but I submitted it moreso as a wakeup call to everyone that things like this need to be discussed. I’m hoping any discussion on this (for or against) during the AGM would help us come up with some positive concepts for future development of the class… we will see. I would even vote for simpler rule which is one board / sail / fin for a single events. Hovever I believe for Championships and for specific places without thermal winds, like we have in Europe (Leba in Poland is an exabple) – you might expect different conditions during 5days racing. There you would require 2 sails I believe. Make it simpler, more suitable for us – mortals, push the manufacturers for better overall equipment developmnet. Instead of purchasing tons of masts / sails / fins – take one which would be the most used. Travelling restrictions is coming an important issue for international racers too! Before you criticise the other sailors online check your facts – I think F192 had his AND F421’s slalom gear from Aruba PLUS his formula gear – so maybe 12 bags isn’t so much really..
To me its the single limiting factor of getting the numbers up in events outside of Europe. In Europe there is multiple airlines who offer good deals on baggage; outside of Europe there is little options. We have a super healthy formula circuit in Australia with often +40 guys at local events in Sydney yet still never get Australian guys coming to international events because it’s too expensive to bring gear (hence why I’m forced to live outside of Australia if I want to do the tour). There is the stigma around that you are wasting your time coming to big events unless you bring multiple sets of gear to tune up. I don’t know the answer…. but something needs to change if we want to go back to +100 competitors at events… ? Got to say that I agree with your comments Sean. Simplicity has to be the key to growing windsurfing no matter the discipline. Good luck at the event. Give em heaps. Do you know which board has Gonzo registered? Thanks for all the updates, we really appreciate them!! Good winds and great results!! Gonzalo ended up with Patrik board… He was flying on it too; I’m pretty sure he would have won the first race had he not been OCS. 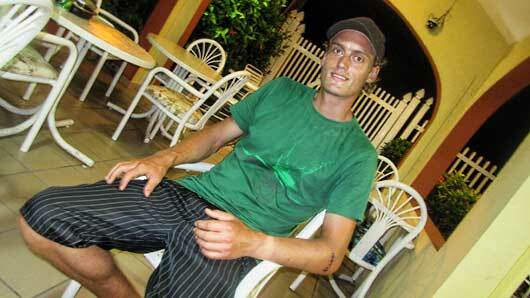 Great report Sean, keep up the good work….your results look ok considering you are on an 11m sail. WOULD REALLY LIKE A 10.0m !!!!!!!!!! 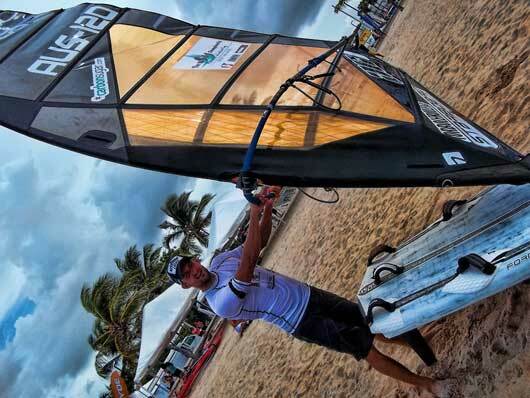 Apparently Paulo Dos Reis also used a 12m all day as well as Antoine (and Wojtek in the last race) – with +25 knots… WTF?! Dennis is on NP?PATRIK now? Put your head down and hang on to that 11m. It’s early days yet. By the sounds of the crashes, it could be a case of the last man standing ,,,, wins! Yeah, Dennis is now on Patrik boards (the same guy imports them in Holland as MauiSails/F2 I believe??) but I believe he’s actually switching to LOFT Sails next season with Benny Van Der Steen and he got the NP’s as a filler for this year … seems to be going pretty quick on them anyhow! Interesting to note that Gonzalo, who tested every single board here before the event started, also chose the Patrik. 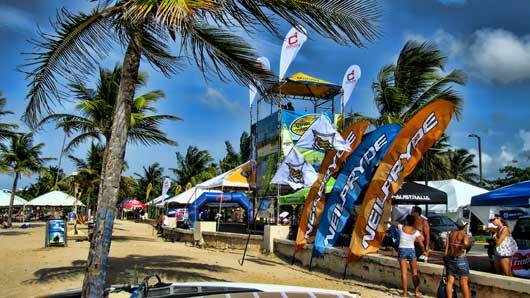 Equipment list is not available yet.Please tell us more about fins used in this event. Ok, here’s what I know off the top of my head. Thanks for the great reports, Sean! Appreciate it! thanks for reports, keep on! Hey Seano, sounds like a fantastic event mate. Good to see Formula alive and well, though it appears a few people have forgotten it’s not a slalom. event. great result in race 10 sux you got taken in race after. It was like I was in a demolition derby today… people crashing in to me or in front of me, everywhere I went! Get any waves back home or has winter set in ….. ? Nah mate….winter has well and truly arrived. Got in a few surfs tho and Bali was magic…plenty of sun, surf & Bintang there! Good luck to you and Steve tomorrow, hopefully you can both jump a few places. Thanks for super good reports, keep going. I wanted to ask about the New Marketing Strategy for the class. What do you suggest doing? What can be done at international level and what can we do at the national level to improve the popularity of FW? There’s a LOT that needs to be done. Unfortunately the committee is still discussing it (painful) but if it was me this is what I’d do. 1) New website. Needs to be modern and needs to have better coverage of the events and be better for media/non windsurfers to follow the action. 2) Dedicated media crew at events (maybe only just 1-2 people) just to shoot photos (or liase with event photographers) to get access to photos and keep news coverage on the website pumping. Also if they shoot their own photos then we can offer them in hi-res downloads for the competitors with a CC licence so guys can use the photos wherever they like. 3) Build some flyers/brochures downloadable on the website which explain what the class is, how to get involved etc. Most sailing clubs have these things available and they are really useful. Also allows the media to get quick access to some facts about the sport for their stories. 4) Along with a new website we need to put together a media-package that includes the stats and spread of the content around the web/tv/radio etc. 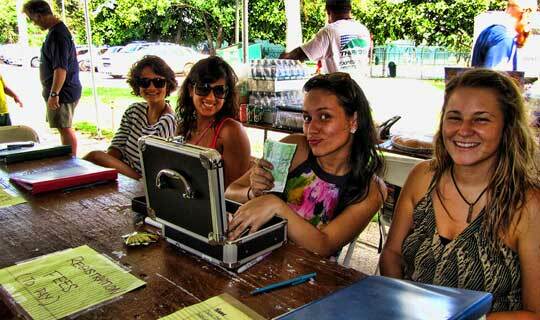 This is what event organisers want so they can pitch to sponsors to get us bigger and better events! There are many more things to do but it has to start small because the FW class doesn’t have much money to play around with and all these things COST. The end result needs to be some kind of platform that the sailors themselves can use to better promote themselves and attract more sponsors, and event organisers can use to attract bigger sponsors to their events. If you build the platform, it’s even possible we get the brands more involved with the class but right now I don’t see any of them chipping in at all and why would they want to? can you fully describe F192 fins kashy xs74/70? I don’t know too much about Antoine’s fins and he’s not the sort of guy to let you touch them. I wouldn’t be too suprised if they are just his old best fins from the last two World Championships. While there has been some improvements in some fins in the past few years, the best fins from 2-4 years ago are certainly still competitive. I don’t think Antoine has done development for any fin brand ever so you’ll probably find they are just stock standard Kashy’s as opposed to some ‘newer’ layups some other guys might have?? I just wrote it as Casper said it … maybe just at the speeds we are travelling even something blunt like a boom end can become sharp? Hi Sean, at firs thanks for all reports! I am interested to know if You have seen any differences(angle,control,..) comparing formula windsurfers using a vmg fins,z-fins and boss fins? I am going to buy one of them (ka$$$hy is to much expensive for my wallet at the moment), but I haven’ t decided yet wich fin (of written) to buy, so if You have seen any diferences and if You would like to share, please wrote your findings. Hmmmmmm, that’s a tough question to answer. I think we’re getting to a level in the fins in most brands where you can be safe to pick any and have a great fin. I used one fin the whole of the Worlds; VMG Blades 70cm. Dennis Littel used a VMG 72cut in many races, Antoine used Kashy’s, Steve Allen used Z’s and Boss, Arnon used Z’s … hard to say if one was better than the other. I think its important to talk to the guys who are using the same board as you and see what kinds of fins they are using. Not that one brand is better than another for a specific board, but you want to make sure you get the right sizing and correct characteristics in the bend for your board as most brands do make some variations. I think if you stick with the major guys like Kashy, Z, VMG, Boss, Virus (although I hadn’t seen a Boss before the Worlds) then you are pretty safe with getting a great fin. What do you think about Gaastra Vapor FW sizes? I have got severne enigma mast 550cm 34imcs and I want to buy Gaastra Vapor 11m2 but I don’t know how will be this mast working with Vapor. What do you think about it? Well, the current Gaastra’s seem to be working well. Arnon and the other guys on them were flying at this event. I have tried the Gaastra’s and they are comfortable and easy so i could recommend them. I haven’t tried the sail with a Severne mast of course but this might actually be ok because I think both the Severne and Gaastra masts are both HARD-TOP. I would flick something up asking the same question on the Gaastra forum (if they reply!) and see if anyone has tried this combo. Thanks for response! My severne mast have got only less imcs -34, Gaastra recomende Gaastras mast of course- 37imcs; the same lenght, I am lighter rider-about 70kg so I think it can be a good combination,can’t it? I will be very thankful if you could ask about it on Gaastra forum. Hmmm, the current Gaastra’s are actually relatively flat sails compared to other brands so maybe with a soft mast like this they might be a little too flat and not point as well. I can buy Severne Reflex I from 2010 too (production), but I had got one severne reflex II(proto version) and I am not satisfied of it. Have you ever sailed on some reflex? Could you compare it with new Vapor? and good luck in Alacati!